Risa Towbin Aqua grew up a fourth-generation Denverite and received a BFA in printmaking and interior design from Colorado State University. 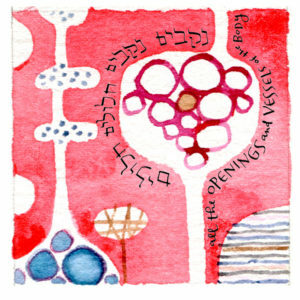 She worked as a volunteer art teacher in Israel and then, back home, in the architecture/interior design field before shifting her focus toward calligraphy and commemorative art. 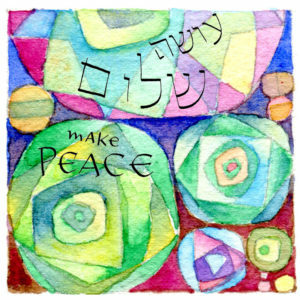 Today she specializes in whimsical watercolor ketubot (Jewish marriage contracts or wedding-vow art) and other text- and scripture-based art and graphic design. She and her husband Hal own Aqua Studio llc in Denver, and you can see and purchase her work at www.RisaAqua.com or at etsy.com/shop/RisaAqua. The work you see here is from the practice of (mostly) daily drawing that Risa began in 2017. She had long wanted to experiment with abstract compositions, but found it hard to make time for explorations amidst the everyday bread-and-butter work of calligraphy commissions, along with the grind and clutter of just keeping up with life. 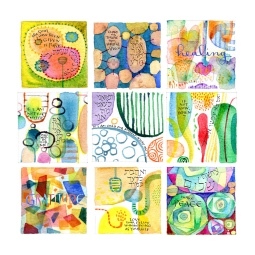 These mini-paintings, just a few inches square and completed in a single sitting, provided a solution. Risa has since found that the practice creates a quiet moment within the constant onslaught of media that has become the status quo. 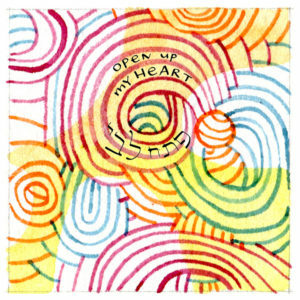 She also sometimes applies text–often from the daily blessings of the morning prayer service–to the daily abstract images, during or after the artmaking. These images can be purchased one at a time or combined into grids of your choosing. They start at $40 for a matted high-quality inkjet print. Risa also has some laser prints that start at $25. Mention Raisin & Almonds, and 20% of your purchase price will be donated to the Colorado Hebrew Chorale!